This is just one of the 8 new Pump Rescue Tenders (PRT) that Suffolk Fire and Rescue Service has purchased in 2008. 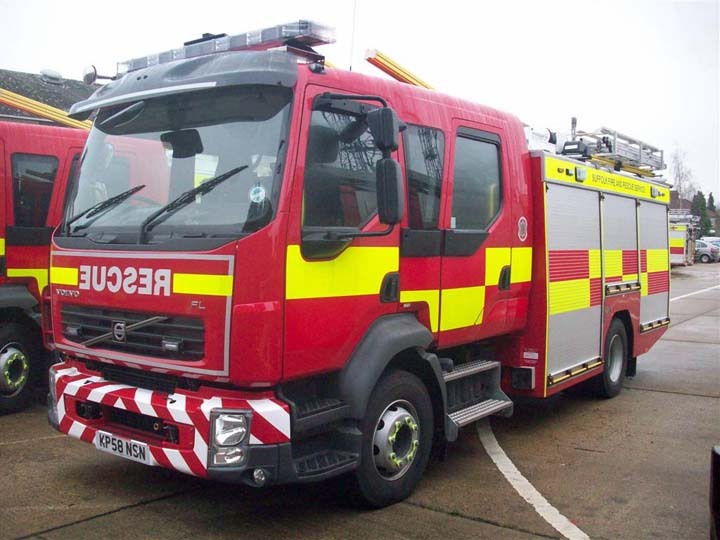 These are the First Fire appliances to have been purchased by Suffolk in 5 years, and are probably some of the most eagerly awaited pumps in recent years, and as first impressions go......they have done a prettty good job!! Hi peter, nice pumps, I take it they are all jdc? do they have cafs? They are all on JDC yes but CAFS, whats that mate haven't heard of that before? Added by Peter Bromley on 25 December 2008. Added by Ian Moore on 26 December 2008. O right ok, erm i couldn't tell you mate tbh, i know they will have foam capabilities but whether it is uses a compressed air system i couldn't say!! Added by Peter Bromley on 26 December 2008. I Thought people would like to know that only 2 of the 8 of the these bought by Suffolk are on the run!!! Despite being in the brigade since November!!!!!!!!!!!!! Added by Peter Bromley on 17 February 2009. Whats the hold up Peter, something wrong with them, you would think with no purchases in 5 years they would be wanting to get these on the run ASAP ! Added by Darren on 19 March 2009. There is now 5 of these new appliances on the run they include all 3 ERT's at Bury, Princes St and Normanhurst and the 2 PRT's are on the run at Sudbury and Leiston. Added by Richard Whiting on 26 March 2009. They are all now on the run, The one in this photo is based at Normanshurst, Lowestoft! Added by Peter Bromley on 23 April 2009. I heard Elmswell are due to get one of these, is that right? Added by Richard whiting on 01 March 2011.